Our PIRE will feature five interrelated projects conducted by International Research Teams (IRTs). The IRT leaders (Ajayan, Mitin, Kono, Stanton, and Bird) will be responsible for meeting their research goals. The IRT faculty were chosen and are grouped into teams according to their unique skills, rather than by institutional affiliation. This organization of personnel around common research themes, regardless of their home institution, provides the best way to soundly integrate all senior participants, ensuring they are each able to contribute effectively to the program goals. 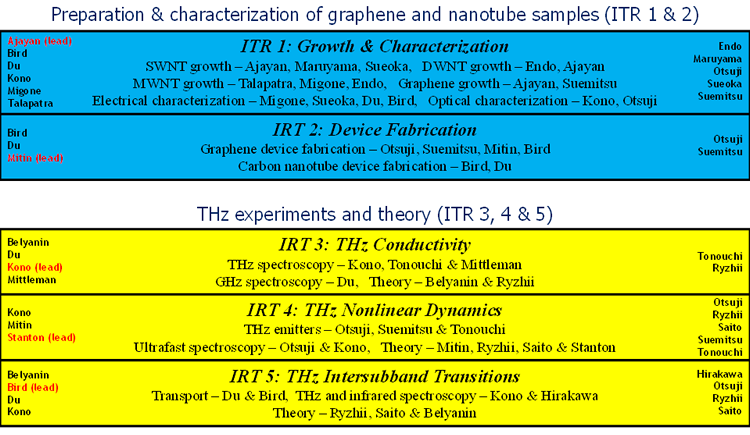 The figure below describes the IRTs. Each U.S. senior researcher will be involved in mentorship of its junior participants, assigning projects in collaboration with their Japanese counterparts, who will ensure continuity of mentorship during research visits to Japan. This structure ensures strong integration of research and education by including senior investigators, graduate research assistants, and undergraduate research assistants on each IRT to conduct research in the U.S. and abroad.